Throughout the week of "Messiah 1999," when Manny hovered between life and death after his massive brain hemorrhage, international delegates to the National Conference of the MJAA and thousands of believers world wide interceded for this humble "general in the Army of the Lord." In 1965, Manny founded the Young Messianic Jewish Alliance of America and was called by many, "The Father of Modern-Day Messianic Judaism." 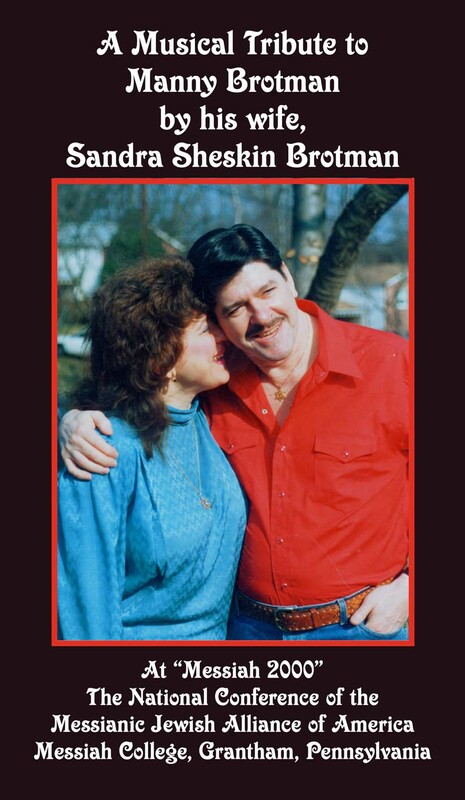 After his unexpected promotion to Heaven, his wife, Sandra Sheskin Brotman, was received at the "Messiah 2000" National Conference with great love and enthusiasm where she sang, under a heavy unction of the Holy Spirit, songs with original lyrics God gave her to comfort herself while lifting up Yeshua. She shared the memory of Manny’s unique anointing in Jewish Evangelism and how he was able to help disciple others by training and example. Hear the miracle of his being "alive" for days after the issuance of his death certificate, and the later vandalization of his messianic gravesite. Since 1954, Manny was not disobedient to God's heavenly Messianic vision and call upon his life – to share for 45 years the message of Messiah Yeshua throughout the world according to God's mandate in Romans 1:16: "to the Jew first and also to the Gentile." The vision and life's work of this "gentle giant" continues under the anointed new leadership of the Messianic Jewish Movement International, headquartered in Phoenix, Arizona.